The supernova was bright enough to be discovered with a modest telescope in an unlikely spot: cloudy north London. On 21 January, around 7 pm, Steve Fossey, an astronomer at University College London, was taking students through a routine lesson with a 35-centimetre telescope at the University of London Observatory. Images of M82, also known as the Cigar Galaxy, appeared on their screens. Fossey noticed something unusual: a star sitting on the edge of the galaxy disc. It did not match Fossey’s memory of the galaxy, nor images they looked up on the Internet. “It kind of looked odd,” he says. As the sky grew cloudy, Fossey’s students checked their telescope for instrumental errors, and also confirmed that the object was not an asteroid. Fossey fired up another small telescope at the observatory and confirmed the object’s location before clouds closed in at 7:45 pm. Then he emailed colleagues at California Institute of Technology in Pasadena. There, Yi Cao took up the baton. Cao, a graduate student in astronomy, sought a spectrum for the object — crucial for confirming the object as a supernova and discerning its type. He quickly arranged to begin observations with a 3.5-metre spectrograph-equipped telescope in New Mexico. Just before 9 am UK time on 22 January, Cao dashed off a note to the Astronomer’s Telegram, a notification service. He reported that the spectrum matched that of a type Ia supernova, and that it may brighten for another two weeks. 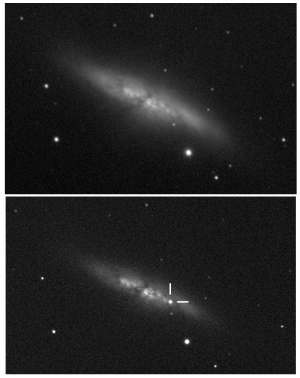 It is also a rare and up-close look at a type Ia supernova, which seem to explode with a predictable brightness, suggesting a common origin. The 1987 supernova was in a different category, type II — explosions thought to result from the collapsing cores of giant stars. A type Ia supernova is thought to form when stellar material piles onto a white dwarf — an old dim star that has already shed excess mass — and passes a critical threshold, igniting a thermonuclear explosion. Some astronomers say that the extra material may come not from a normal or large star, but rather from the merger of two white dwarfs (see ‘Kepler clue to supernova puzzle’). Regardless, astronomers agree that type Ia explosions are found most often among old white dwarfs. Robertson says that is why it is somewhat surprising to find the supernova within M82, famous among astronomers for being a young, star-forming region. 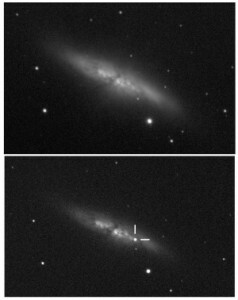 Astronomers around the world will now monitor the precise way in which the supernova brightens. They have relied on the consistency of type Ia supernovae brightness to make very accurate distance measurements. These cosmic yardsticks, which astronomers call ‘standard candles’, were crucial in the discovery of dark energy, the mysterious force that is accelerating the expansion of the Universe.